Al Diaz is best known for his collaboration with Jean Michel Basquiat on SAMO©, graffiti that appeared in lower Manhattan from 1977 to 1979. SAMO© initially became known because of its wit and sarcastic humor; but became a globally recognized graffito after Basquiat’s rise to fame. 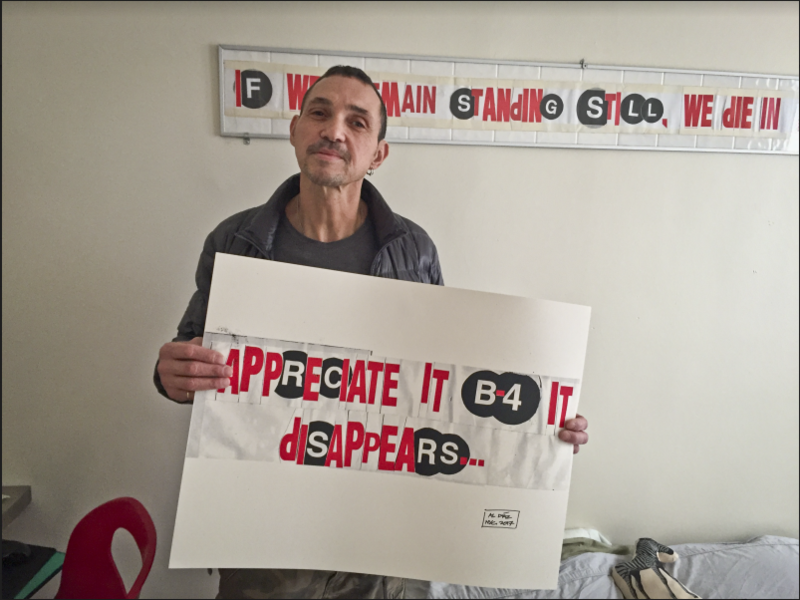 A prolific and influential first-generation NYC subway graffiti artist, who later became a text-oriented street artist, Al Diaz’s career spans 5 decades. Al Diaz will unveil a mural on April 13th at the Essex Art Second Saturday event from 6-9pm, so we interviewed him to give people in San Antonio a little more background on who this influential artist is and what he’s bringing to the event. Q: When did you start painting and why? A: I started doing art when I was a child, like 6 months old. I don’t remember the first time but it’s always been there. It started with me drawing with my fingers in my crib. It’s always been with me. Q: As you grew up, got older and in elementary or middle school, were you training or were you just doodling? A: Me and a classmate, who now draws for Marvel comics were the two most efficient artists at our school. I went to Catholic school for 8 years and always remembered that we were the most talented artists there. Q: Was is in high school when you got into graffiti art? Q: How would you classify street art vs graffiti art? A: Street art is more of an academic and artistic theme. Graffiti is more of ego-centric, you think of getting your name around more than the next guy. Some guys develop some style during it; but it’s generated by the desire for people to see you name around. A graffiti artist isn’t necessarily a street artist or vice versa. It’s a great misconception think. Q: Let’s talk about SAMO, how did that idea come about? A: The idea was that it was a product, it was based on the idea of a religious cult that would be able to do whatever you wanted it to do. The word SAMO came from “same old, same old” but it could mean anything. It was always changing, it was a vehicle to express our angst, express anger at consumerism. It was never meant to be about an individual. Q: Bringing your mural in San Antonio, what do you want to leave the people here? A: I just like to raise people’s consciousness as to what’s going on with the planet. It’s very topical of what I like to talk about. Q: What would say to aspiring artists? A: Keep doing what you’re doing, you can be influenced by others but do your own thing. Don’t emulate and stay with your voice. The 2019 Essex Music and Art Fest in San Antonio will change the landscape of events downtown by providing the city with a much needed platform for creative people. One of our favorite quotes from our interview with Mr. Diaz was, “Art in communities can bring people together”. We believe that’s exactly what Essex will do. We are constantly working to raise the bar on our communication. So, please feel free to drop us a suggestion how we can improve, or if you just want to say hello. We'd love to chat with you. If you are interested in talking to any of our partners reach out to them below.